A new curly-mustached competitor to FarmVille just arrived in a covered wagon. 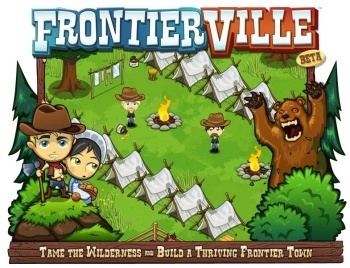 Zynga launched a brand new title on Facebook this week called FrontierVille. Anyone familiar with other Zynga titles FarmVille and FishVille should be able to get the idea of the game just from its title. FrontierVille is very similar but takes place in the time of train robberies and excessive mustaches. My first impression of FrontierVille is that it has a certain new layer of depth and feels even more RPG-like than FarmVille, which is somehow able to mask to its casual audience that it really is an RPG. You'll still harvest crops, but that's only part of the game. Players must also clear weeds and debris from their area to place new objects. Building a structure requires a certain amount of wood, which is obtained through chopping trees. There's a bigger feeling of doing multiple tasks for multiple purposes in FrontierVille. Every action yields icons such as food, energy, and experience that the player now clicks to pick up. They might also randomly release a hidden item to collect, or a snake to clobber. Other gameplay elements of FrontierVille include the abilities to craft items and to adjust the design and colors of objects such as the player's covered wagon. Further, the game has a quest-like system that constantly gives players goals to drive them along. At first this might be simply clearing some grass, but later it'll include finding a lost sheep, visiting friends, or building a cabin. Horseshoes are the microtransaction currency Zynga uses to actually earn money off its game this time, which can be used to purchase animals, buildings, and decorations which are like their FarmVille counterparts but more old-timey. New areas, such as one called Gold Rush, are currently being teased but not available yet. The best part: Characters can still have dejected looks on their faces and afros. Thanks, Zynga.